Louisiana’s vast coastal wetlands are unique in our nation and have been a great resource for the state’s residents and its diverse coastal wildlife. In recent times, however, it has become apparent that they are prized for something even more important—safety. Coastal wetlands reduce the negative effects of storm surges that hit where people live, like New Orleans. Scientists estimate that a storm surge loses one foot of height for every mile of wetlands it crosses. We saw the effect of lost wetlands when Hurricane Katrina hit New Orleans in 2005 with a much higher storm surge than would have occurred if Louisiana had not suffered substantial loss of coastal wetlands in the last century. Today, Louisiana is losing coastal wetlands at the average rate of a football field every 90 minutes. As a response to the damage wrought by Hurricanes Katrina and Rita, the state created the Louisiana Coastal Protection and Restoration Authority (CPRA) in 2006. CPRA is responsible for the state’s effort to slow the rate of coastal wetlands loss and reclaim as much of the lost coastal wetlands as possible—both to renew the unique habitat of the Louisiana coast and to protect inland areas like New Orleans. The work of CPRA is critical to the State of Louisiana and is supported broadly throughout the state’s populace and by its elected leaders from both political parties. CPRA has developed a Coastal Master Plan of over 100 projects to be undertaken over the next 50 years at an estimated cost of $50 billion. The Master Plan is updated every five years. The latest update was approved by the Louisiana Legislature in 2017. Louisiana is about to undertake its first major coastal wetlands restoration project, called the Mid-Barataria Sediment Diversion Project. The Project will cost approximately $1.3 billion and will be paid for entirely by funds available to the State of Louisiana. CPRA, engaged my firm, Van Ness Feldman, in 2017 through our colleague former Senator Mary Landrieu (D-LA), to help in the effort to expedite the permitting of this first major coastal wetlands rehabilitation project. Thanks to the Fixing Americas Surface Transportation (FAST) Act and the current Administration’s implementation of that legislation, the effort to expedite the permitting of this project, thus far, has been promising. Louisiana has experienced the loss of over 1,800 square miles of its coastal area since 1930. The root cause of this problem lies in the United States Army Corps of Engineers’ (the Corps) response to the Great Mississippi River Flood of 1927. After this catastrophic event, the Corps levied the Mississippi River to prevent flooding —an action Louisianians supported and for which they have been grateful. However, no provision was made in the levee system to allow silt-laden river water to deposit silt into the coastal wetlands. This periodic deposit of silt had occurred for thousands of years and is critical to sustaining and building the coastal wetlands of Louisiana. The annual deposit of silt to the coastal wetlands from the flooding of the Mississippi and other tributaries of the Mississippi counterbalanced the natural subsidence of the land. Without the periodic recharge of this silt, the land has continued to subside. A second development in the last 80 years has aggravated and accelerated Louisiana’s coastal loss. Freshwater plants in the coastal wetlands of Louisiana hold the sediment together forming our freshwater coastal wetlands. As oil and gas were discovered and developed, first in Louisiana’s coastal wetlands and later in the federal waters off the coast of Louisiana, canals were dug through the coastal wetlands both to access drilling sites and to lay pipelines across the wetlands to carry oil and gas to the rest of the nation. Often these canals have allowed saltwater intrusion into the coastal wetlands, killing the freshwater plants that held the sediment that forms the wetlands. As these plants die, the sediment is released and the coastal wetlands eventually become open water. A map that plots the routes of hurricanes that hit land along the Gulf of Mexico from 1916‑2016 illustrates why Louisiana’s disappearing wetlands create such a safety issue for the state. Louisiana has been ground zero for hurricanes once they enter the Gulf of Mexico. As Louisiana’s storm surge protection disappears, these hurricanes hit populated areas of Louisiana, like New Orleans, with ever greater force. 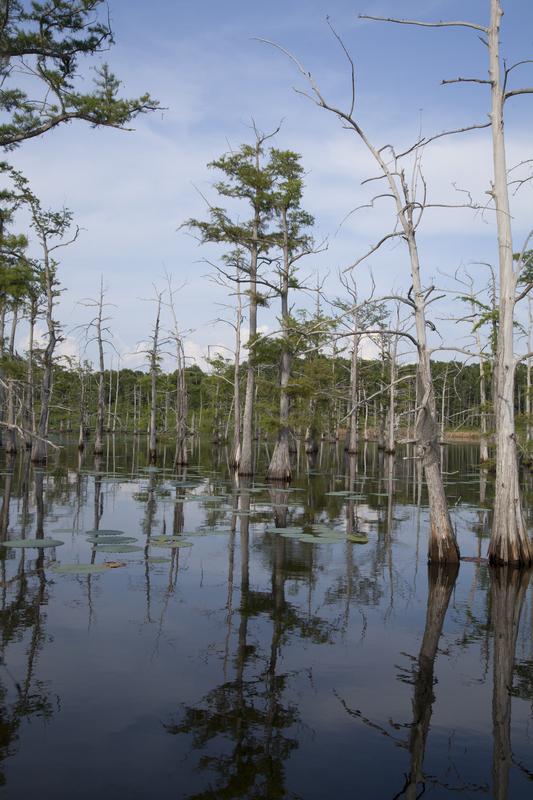 To reverse the process that began with the leveeing of the Mississippi, CPRA is sponsoring projects to return silt to the state’s coastal wetlands. Two of the biggest projects the state is undertaking are the Mid-Barataria and the Mid-Breton Sediment Diversion Projects. These projects would cut the levees south of New Orleans on both sides of the Mississippi River, replacing sections of the levees with a lock and concrete chute system so that the river’s water can deposit sediment in previous coastal wetlands areas at certain times of the year. These projects together will cost the state approximately $2 billion. The first project to be undertaken is the Mid-Barataria Project, which would release water west of the Mississippi into the Barataria Basin. Mid-Barataria is about a year into the federal permitting process. The second project will be Mid-Breton, which is currently in the early stages of design. Mid-Breton will deposit sediment east of the Mississippi, south of New Orleans. The state is going to pay for these projects through CPRA with funds received from the settlement of the state’s claims against British Petroleum after its devastating 2010 well blowout in the Gulf and from revenue sharing funds provided to the state through the Gulf of Mexico Energy Security Act (GOMESA) of 2006. A 2006 amendment to the state constitution, adopted by the people of Louisiana, commits all GOMESA funds to coastal protection and restoration. The state legislature has committed the BP settlement funds to coastal protection and restoration projects. While the financing for the Mid-Barataria Project has been finalized, the federal permits have not. When the CPRA approached the federal government to receive the necessary 404, 408, and other permits, the State was told it would take at least six years for the federal government to issue the necessary permits. Given the current rate of land loss, that time frame was, and is, totally unacceptable. Imagine how much more land Louisiana would lose in a six-year federal permitting process before the federal government would even allow the state to move forward with this self-funded project to save its coast. In 2015, as part of the Highway Reauthorization Act, Congress adopted the FAST Act. The FAST Act was developed by Senators Rob Portman (R-OH) and Claire McCaskill (D-MO) to expedite the permitting of major infrastructure projects. The Act basically covers a wide range of infrastructure projects that cost $200 million or more. The Act created the Federal Permitting Improvement Steering Council (referred to as the Permitting Council). The Council consists of representatives of the Departments of Agriculture, Commerce, Interior, Energy, Transportation, Defense and Housing and Urban Development as well as the Environmental Protection Agency, Army Corps of Engineers, Federal Energy Regulatory Commission, Nuclear Regulatory Commission, Advisory Council on Historic Preservation, Office of Management and Budget, and Council on Environmental Quality. The Council has an Executive Director and a small staff assisting the Executive Director. The primary function of the Permitting Council is to accept certain qualifying infrastructure projects for its “dashboard”, establish a lead federal agency for the federal permitting process for these projects, and establish a timeline for the permitting process. The permitting timeline and status of the permitting process is posted on the “dashboard” and the timeline is revisited periodically to ensure that it is current. The Permitting Council was “stood up” in the last year of the Obama Administration. Near the end of 2016, Governor John Bel Edwards (D-LA) requested that the Mid-Barataria Project be placed on the Permitting Council “dashboard”. The Governor’s request was granted. A clear early emphasis of the Trump Administration, based on public statements by the President and various Administration officials, was expediting the federal permitting of infrastructure projects. Much of the Administration’s work on this issue in 2017 was internal, but on August 15, 2017, President Trump issued Executive Order 13807 on infrastructure. In this Executive Order, the President confirmed that the Administration’s efforts to expedite federal infrastructure permitting will build on the FAST-Act and that the Administration’s goal is two years for the federal permitting of infrastructure projects. Before the Executive Order was issued, the Permitting Council had designated the Corps of Engineers as the lead agency for permitting the Mid-Barataria Project and the first timeline established by the Permitting Council for Mid-Barataria was six years. The President’s Executive Order gave us hope for an accelerated permitting process. In late August 2017, the leadership of CPRA and Van Ness Feldman began to consider options for accelerating the permitting of the Mid-Barataria Project. We decided that the best option available to us would be to negotiate an MOU between the federal family of agencies involved in the permitting of Mid-Barataria (seven different departments and agencies plus the Permitting Council and CEQ) to establish protocols that would speed up the permitting and also adopt the two-year timeline as a goal. The federal family already had an MOU among themselves about the permitting of the Project, but the State and its agencies were excluded from the MOU. We approached the Administration with the idea of an MOU through the Associate Director of CEQ for National Environmental Policy Act (NEPA), who liked the idea and shared with us some models for an MOU. We drafted the first iteration of such an MOU and submitted it to the Associate Director, who then gathered representatives of all federal agencies involved in the permitting into a negotiating team. The negotiations took approximately five months and were led on the federal government side by the Acting Executive Director of the Permitting Council, the Associate Director of CEQ for NEPA and, toward the end of the process, the Associate Director of CEQ for Infrastructure. Finally, on January 25, 2018, we achieved the MOU that we sought and learned that it was the first MOU under the FAST-Act executed between a state and the federal government. It was also the first MOU under the FAST-Act and the Presidential Executive Order establishing the goal of permitting in two years. Most importantly, the MOU seems to be working—communications and cooperation have improved markedly among the federal agencies and between the federal agencies and the state. The newest timeline for permitting this process is now down to a little under three years and we expect to compress this timeline further on Mid-Barataria and hope to be able to achieve the two-year permitting goal on future CPRA projects. The Administration’s process has worked to improve the permitting timeline on our project and our project is now being viewed by many around the nation as a “test case” of whether or not the federal government can really expedite environmental permitting. With the current maze of federal environmental laws and regulations, not surprisingly, the Project faced another problem. As the coastal wetlands continue to disappear and become open salt water, dolphins have moved into these areas that were previously unsuitable as dolphin habitat. The objective of the sediment diversion projects, however, is to return these open saltwater areas to freshwater wetlands through the re-introduction of sediment. Over the long period that the sediment is being re-deposited, the process of converting these saltwater areas back to freshwater wetlands will make these areas inhospitable as dolphin habitat. The Marine Mammal Protection Act (MMPA) is similar to the Endangered Species Act in that it attempts to protect covered species, like dolphins, by protecting the habitat in which they reside. The Act does not contemplate a project like the Mid-Barataria Project that attempts to reclaim coastal wetlands. Attorneys in the Department of Commerce could not find sufficient legal authority in the existing Act to provide a waiver for the Mid-Barataria project. Without such a waiver, the project could not move forward. Therefore, we were forced to approach Congress to obtain legislative authority to waive the Act. Fortunately, several national environmental and conservation NGOs are committed to the restoration of Louisiana coastal wetlands. With their assistance, we were able to develop a very narrow amendment to the MMPA that waives the Act for the Mid-Barataria and two other coastal restoration projects in Louisiana. With the help of these NGOs, we were able to achieve the unanimous support of Congressional Republican and Democratic leadership to include the amendment in H.R. 1892, the Bipartisan Budget Act of 2018, which was enacted February 9, 2018. Based on this legislation, the Secretary of Commerce has waived application of the MMPA to the Mid-Barataria project. We have achieved workable solutions for now to the two federal policy impediments to the Mid-Barataria Project, Louisiana’s first major project that attempts to regain some of the coastal wetlands the state has lost over the last eighty years. The timeline for federal permitting of the project has been reduced under existing law through the MOU between the state and the federal government that implements the FAST Act of 2015 and the President’s August 15, 2017, Executive Order 13807. A similar opportunity exists for other infrastructure projects that cost at least $200 million. Time will tell just how successful this effort to expedite federal permitting under existing law will be, but we have already reduced the projected federal permitting timeline by half. The second solution involved a change in federal policy that only Congress could provide. Despite the partisan nature of our current politics, the Congressional Majority and Minority were able to agree on a limited change in federal policy to allow the Mid-Barataria Project to move forward. Legislation is often much more difficult to achieve than reaching an agreement with the Executive Branch of the federal government – and it was very difficult in this case – so legislative “fixes” to real problems are still possible. Undoubtedly, this project will face more challenges at the local, state and federal levels. Nevertheless, we have been able to find solutions to the two largest issues that confronted the project and are confident we can find solutions for other problems that might arise. Reprinted with permission from Municipal Water Leader.